RapID Check - Forex World – We Deliver Love! Send Money to the Philippines, Send Cargo to the Philippines, Cheap Flights & Travel Packages. Registering as a Remittance Customer Made even Easier! 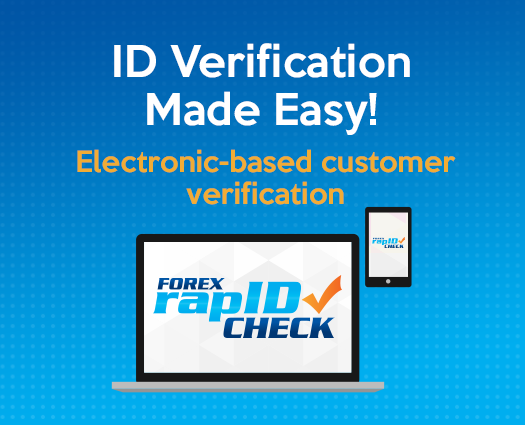 During Forex World’s customer on-boarding process, Forex World has an obligation to identify each prospective remittance customer in accordance with its anti-money laundering obligations, and may use the services of a third-party identification verification service provider (such as a credit reporting agency). The information you provide will be matched against public and government sources and personal information held by the credit reporting agency on your credit file. The process is for identity verification only. Collection and verification of customer information is a mandatory KYC (Know Your Customer) requirement under the AML/CTF act and must be completed for approval to use Forex World’s remittance service. All information provided will be treated in accordance with the Privacy Act.